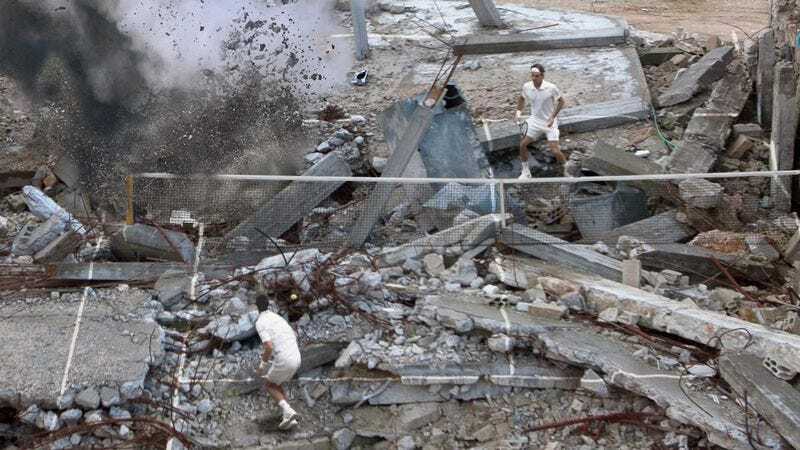 GHOUTA, SYRIA—With its uneven, debris-strewn playing surface causing balls to bounce severely and unpredictably, players at this year’s highly anticipated Syrian Open admitted Thursday that the tournament is a serious test for anyone unaccustomed to its notorious rubble courts. Unlike the perfectly manicured grass, clay, and hard courts at other tennis events, the annual tournament’s heaps of concrete, ash, and mangled steel girders reportedly frustrate first-time competitors and veterans alike, leading to numerous early-round upsets and frequent in-match forfeitures due to lost limbs. Describing the jagged detritus around the net as a major obstacle for the serve-and-volley strategy, players told reporters that it often takes several days to become accustomed to the pained wails of distress and intermittent bursts of gunfire issuing from the Syrian Open’s otherwise eerily quiet stands. According to those who have competed in previous years, the event gives a distinct advantage to more agile players who can easily dash around charred husks of destroyed vehicles while adjusting their footwork to avoid triggering the many active landmines littering the court. While some thrive in the slower, extremely cautious playing style of the rubble courts, the Syrian Open remains incredibly divisive among players. Many have reportedly complained in recent years about the tournament’s strict policy of wearing all-white Kevlar vests during match-play, and several high-profile stars have also publicly demanded that officials install a retractable roof enclosure to shield against the many ballistic missiles landing in and around the courts. Though the Syrian Open offers very limited access to food and clean water, and has not featured a functional scoreboard since 2011, players said the event still attracts competitors from across the world seeking to prove themselves and take home the highly coveted silver car bomb. As with last year’s event, Syrian president Bashar al-Assad is expected to attend the men’s final Sunday and will be seated with his wife in box seats just above the centre court mass graves.